With so many types of stones for sharpening, it can be difficult to determine what the best stone is for your woodworking needs. Fortunately, the variety of stone materials will allow you to select a material that will meet your needs and stay within your budget. The three main types of bench stones are oilstones, waterstones and diamond stones. 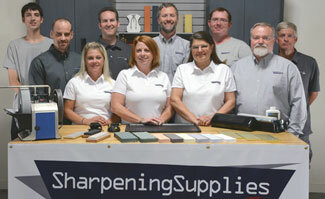 Since every woodworker’s needs and preferences are different, understanding the advantages of each stone will allow you to be a more informed purchaser of sharpening stones. Oilstones are the traditional stones that have been popular for years. Today they are available in man-made and natural stones. The man-made stones are made of either silicon carbide or aluminum oxide abrasives. These are generally available in coarse, medium and fine grades. The natural stones are made of novaculite and are available in grades such as Soft Arkansas, Hard Arkansas, and Hard Translucent Arkansas; the harder the grade, the finer the grit of the stone. 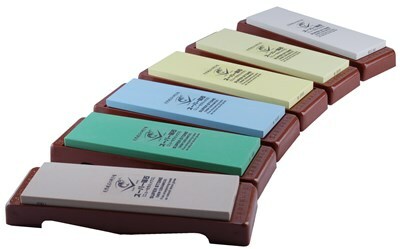 The natural stones are generally finer grits than the man-made stones so it is common to have both man-made and natural oilstones in your sharpening kit. As the name suggests, oilstones use oil as a lubricant and to remove the swarf to keep the stone from getting glazed. The oil used is generally a light mineral oil. Waterstones have become very popular among woodworkers because they cut faster than oilstones. Like the oilstones, waterstones are available in both a man-made and a natural variety. However, in the western world, the man-made stones are significantly more popular. Most waterstones are made of aluminum oxide abrasive. 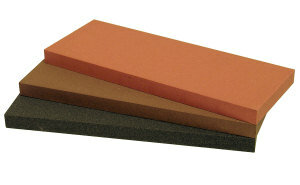 While this is the same type of abrasive material as used in some oilstones, the stones are quite different. First, unlike oilstones, waterstones use water to remove the swarf. Using water makes it easier to clean up and more convenient to use. Secondly, waterstones cut faster than comparable oil stones because the binding material that holds the stone together is softer. The softness of the stone allows the stone to cut faster because sharp new material is constantly being uncovered. However, the softness is also the biggest disadvantage of the waterstone because it must be flattened regularly. Many woodworkers are catching on to the advantages of diamond stones for some good reasons. Unlike oil and water stones, diamond stones are all man-made. 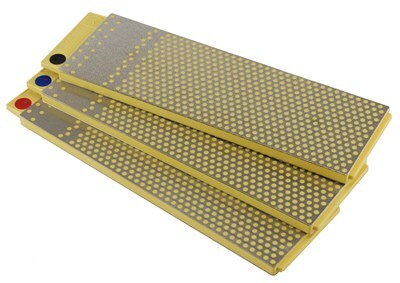 These industrial diamonds are applied to a metal backing to create an abrasive surface. The diamond stone can be extremely versatile. It can be used to sharpen any woodworking tool. It can even sharpen carbide tipped router bits that both oil and water stones can’t touch. Diamond stones do not wear unevenly because the diamond surface is so hard. Because of this diamond stones can be used to flatten oil and water stones. Like the water stone, diamond stones use water to remove the swarf. There is no reason to stick with only one type of stone. Another option is to choose the best qualities of each stone and use them to your advantage. The diamond stone works so well on coarse work because it cuts aggressively and stays flat. The waterstone is great for putting on the final edge. We've selected the best hybrid combination and included a coarse/fine diamond stone with a very fine 4000/8000 waterstone. Because both stones use water, they are very compatible. View the money saving woodworking stone kit. Questions on sharpening for woodworking?